While the world changes at an unprecedented pace, education systems in most countries remain decades old, with today’s schools closely resembling those attended by our parents and grandparents. The changing job landscape, automation, and technology mean that students need to be prepared for jobs that might not yet exist, but most schools are struggling to stay up-to-date. But some schools are continuously raising the bar when it comes to innovation. From a gender-free school in Sweden, to a cubicle school in Ohio, some of the most innovative schools in the world are breaking all the rules of traditional education, and are achieving incredible results. Here, we take a look at some of the concepts behind these innovative schools and what we can learn from them. The Steve Jobs School aims to be a new school model for a new era. Just like its namesake, the school encourages children to find their passions through learning and exploration. Founded in Amsterdam, the school has since opened branches all over the Netherlands and Belgium, and one in South Africa. At Steve Jobs Schools, all learning is self-guided, with each child receiving an iPad pre-loaded with educational apps and games. While parents can offer guidance, the children are encouraged to choose what they want to learn and when. This approach has shown to increase attention, motivation, and improve learning. But not all learning is computer-based. Social skills are also honed through collaborative projects with other children. One of the most fascinating aspects of the Steve Jobs School model involves parent engagement. Every six weeks, the parents and coaches (they are not called teachers) meet to check their child’s progress and update the individual learning plan. Most importantly, parents use a personalised iPad app to track their child’s progress in real time, providing more detail than any report card or parent-teacher meeting ever could. Mixed gender schools have been the norm in most Western countries for decades, but Stockholm’s Egalia School takes the concept to a whole new level. This revolutionary school system is based on the principle of complete equality and aims to avoid any type of discrimination, including age, skill, class, race, disability, and gender. Gender-specific names and labelling are avoided. Instead of referring to ‘girls’ or ‘boys’ or ‘he’ and ‘she,’ the teachers use group names or the childrens’ first names. When reading books or telling stories, the teachers often change the roles and let the prince be saved by the princess or use gender-neutral characters. The aim of this system is to teach children to judge each other by their actions and personality instead of pre-conceived gender roles. Carpe Diem Schools more closely resemble open-plan offices with cubicles than traditional classrooms. These free public schools use a blended learning model for middle and high school students, meaning that project-based learning goes hand-in-hand with self-paced learning using computers. Instead of being separated into different classes by skill, students are each met at their own individual level. Each student learns at their own pace using their computers in an open plan classroom. This means that they can accelerate or slow their learning without being held back or falling behind. In addition to the software-based curriculum, they also work on team projects with other students and teachers in a more traditional classroom setting. Much of this involves research-based learning, where students are encouraged to make and learn from their mistakes every day. The students get opportunities to work directly with local colleges, community organisations, and real businesses to solve real-world problems. Designed for the modern, millennial student who is more comfortable with technology than old-fashioned methods, the Carpe Diem schools in Arizona are outperforming all other schools in the state, with an average proficiency of 92% compared with the state average of 65%. Innovative doesn’t always have to mean high-tech. Imagine a school without walls, nestled between rainforests and rice paddies, built solely from bamboo and powered by the sun. The Green School in Bali has made it its mission to educate students on sustainability, using a holistic approach. After watching “An Inconvenient Truth,” John and Cynthia Hardy, an American expat couple living on the Indonesian island of Bali, decided to sell their jewellery business and build a completely green school to teach the next generation how to live sustainably. Since opening in 2008, the Green School has grown to teach 400 students from kindergarten to high school, even offering a boarding option. Traditional topics, like maths and languages, are combined with experiential classes, including cooking, gardening, and even traditional Balinese mud wrestling. The teachers are as diverse as the students, coming from all around the world to teach at Green School and learn about its mission and values. Green School is becoming much more than just a school; it is turning into a community. More and more parents are building houses within walking distance of the campus in a green, sustainable way, using the principles their children learn at school. But despite ensuring that 20% of students are Balinese, the school has been criticised for a lack of diversity among its mainly foreign student body, as well as its high fees, which range from $7000 to $16,000 per year. 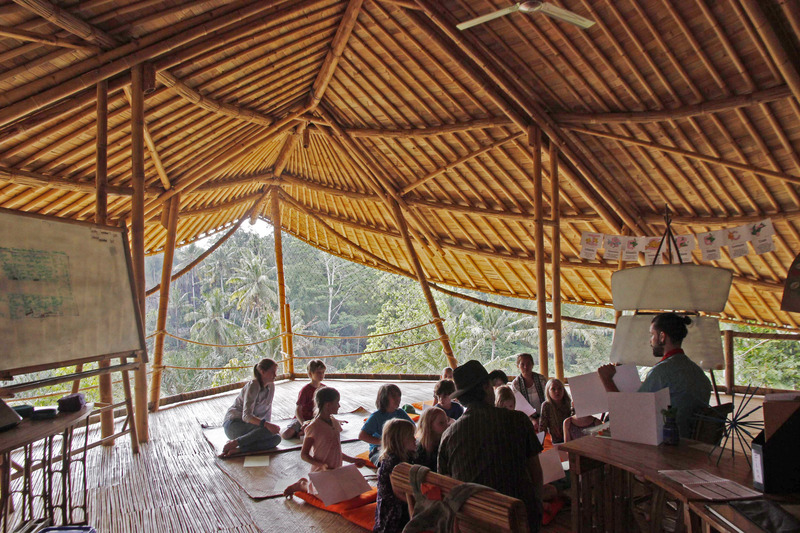 Despite the premium fees, the Green School aims to act as a model for Bali and the world, and to raise a new generation of global green leaders. The concept is based on three simple principles: be local, let the environment lead, and think of your grandchildren’s future. After visiting in 2015, UN secretary general Ban Ki-Moon said it was the most “unique and impressive school” he had ever visited. Despite being located in the very heart of Silicon Valley, the world’s high-tech epicentre, the Waldorf School of the Peninsula takes a very low-tech approach to education. That’s right—the employees of technology firms like Apple, eBay, Google, and Yahoo send their children to a school where no screen, tablet, or smartphone can be found in sight. The Waldorf School calls it “renaissance education.” But why are so many tech leaders insisting on schooling their kids without using technology in the classroom, or even at home? The idea is to reduce the distractions of modern media, and creating the physical and mental space for creativity and innovation, which are skills highly valued by start-ups in the tech scene. Instead of relying on software to deliver their lessons, the Waldorf School believes in a more traditional teacher figure that cares about the class and individual students. All subjects are taught using creativity, arts, games, projects, and exploration. For example, certain maths principles are taught through knitting, languages are practised during games, and storytelling plays a central role. Neither the teachers nor the parents are worried about the students lagging behind in their technology education. Technology is getting simpler and more intuitive every year, they claim, so that students will easily catch up. Considering the rush of most schools to use technology as much as possible in the classroom, the Waldorf School’s approach is an interesting alternative. While each of these schools takes a different approach to classroom innovation, they all aim to equip students with skills to navigate a fast-changing future. A focus on personalised learning teaches them to take an active role in their own education. Project and team-based learning will allow them to apply their skills to new and evolving job roles in the future. Hopefully other schools will follow suit to take these innovations to the mainstream. What do you think about these innovative schools around the world? Please share in the comments below. Whilst traditional type schools have a lot to answer for in many ways, by reducing the role of the teacher to an overseer, which is what it appears like in some of these schools above, I fear we are throwing the bath out as well as the water. I have seen classes and schools that are transformative for children and adults, enabling them to expand themselves in ways that anyone would be more than happy about. Also, the way parents and society influence children can sometimes require active intervention. Inspiring teachers can organise the environment so that students can confront and deal what they need to in days, rather than weeks or years. The main issue we face I feel is more about the paradigms teachers are trained with. That is what needs an overhaul. One school I would recommend, that looks traditional however once you scratch the surface you will see it is not is the Bronx Charter School in New York. I am interested in learning more about Waldorf School . I too believe that technology cannot replace the teacher in the class. Lovely article! I always believed in integrating education with stories, activities and using less of technology!!! I’m from the Netherlands but live already more than 10 years in Indonesia and support there some schools. Also I don’t believe that technology can fully replace inspiring and passionate teachers but if in remote area’s is a lack of, none or really uninspired teachers, then technology could be a great help to fulfill the need and the human right for education for the children there. Therefore i should plea for a worldwide web which contains basic educational content supported by the needed technology in that area’s all over the world. I believe that it must be possible. The mind must be consulted in its own growth. I really appreciate the way you described Jennifer. Hope to see more posts like this from your end. Thank you. I am 36 years old and I can still remember vividly my primary and secondary education, during these period we don’t even have phones how much more tablets, I still tell my children stories of activities in my community and school. My children prefer to stay at home instead of walking in the park because of Ipad and television, they are so distracted these days. There is a significant body of research and scholarship which investigates the social nature of learning, not the learning how to be social, but that social interaction, collaborating, hashing out ideas, thinking out loud and with a certain amount of exposure and risk, is really how we learn. I am also concerned with our love affair with technology as a tool to personalize learning, which also removes the child from physically interacting with others. This might exacerbate the problems we are seeing everywhere with teens who are addicted, literally, to their devices. Yes, technology is a fantastic tool, no question, but I wonder the cultural impact of a generation of children with the underdeveloped skill of negotiating real human interactions, in which there is so much messiness, ambiguity, and confounding complexity. It is so much harder to raise a free range organic children in modern days. Worries of crime, gadget addiction, tv, smartphone, parents busy work life, etc. we can hardly see kids freely wander outside home, let alone explore into the unknown. Really love this type of schools. If I have an amount of money to enroll my child in one of these schools I will. I think they will enjoy being here and will learn more over normal schools. We know how boring schools are and we always find ways to make it more interesting and enjoyable.